What kind of teachers do schools in Asia REALLY want? Are you looking for a job teaching English in East Asia? Do you want to know what schools/employers there really want? For me this data that I am going to tell you about wasn't really surprising, but that's because I have been part of the teaching English in Asia thing either as teacher or researcher for a good 13 years. I started teaching in Taiwan in 2004 and then later Korea and China. I worked in a lot of schools as either a full, part-time or substitute teacher. I have also applied for and looked at a lot of jobs. So the words and qualities of a teacher that schools are actually looking for that you will find here are not a surprise to me. I could have roughly told you these before without doing any research since I have seen so many jobs. It's cool to actually see some data. So how did I get this data? I did a combination of command "f" on a Mac to find the count of keywords on a page (multiple job ads on a page) and sometimes a count of the Google search results. Towards the end of the article I will tell you how you can use this info to help. What do employers want in ____? What do employers in Taiwan want? These are some of the most common words employers used on Tealit.com on 02/19/2018-11/27/2017. These were based on 50 job posts. The number represents how many times it was placed on the page. I only counted the word "degree" here and one other time. A degree is pretty much a given requirement to teach English in Asia. What's it like to teach in Taiwan? What do employers/schools in Korea want? site:koreabridge.net/jobs "keywords below go here"
site:eslcafe.com/jobs/korea "keywords below go here"
What's it like to teach in Korea? What do employers want in China? For this I searched 2 sites: eslcafe.com via Google and eChinacities. site:eslcafe.com/jobs/china "keywords below go here"
The below results were found by site search on jobs.echinacities.com, "teaching jobs". What's it like to teach in China? What do employers in Japan want? 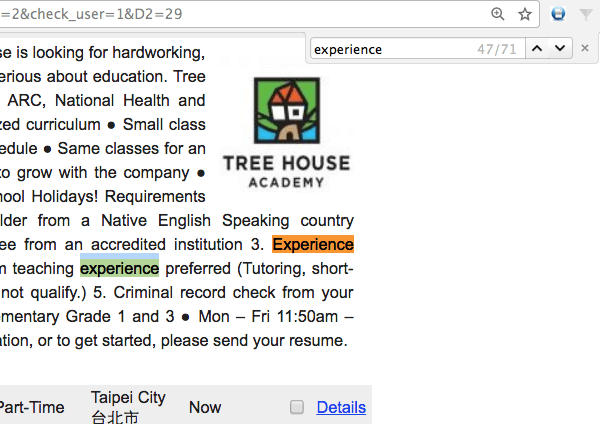 This one and the Taiwan one are the most accurate as all the job posts were on one page, so I could easily find the keywords and get a direct count. What's it like to teach English in Japan? Well, it's not extremely accurate for a few reasons. Some of the words here have were not necessarily used in the same sense. For example, the keyword "enthusiastic" is a pretty common quality that schools are searching for in a teacher, but the word can also be used in a different way like the school could say we are "enthusiastic" about making learning English fun. Some results may include multiple postings by the same school or recruiter which inflates the keywords mentioned in that post. Some keywords may have multiple meanings. For example, most schools want “experience” but a smaller percentage may accept teachers with “no experience”. I didn't search for all of the same exact keywords on every site which resulted in some differences. It's a bit wabi-sabi ;-), but I think it still can help. Here is a list of keywords found in job advertisements from most to least popular. What can you gather from this? Schools prefer teachers with experience, however there are a few schools that have stated above that they accept teachers with "no experience". Most of the jobs in East Asia are for teaching children. According to the numbers above there were 30,000 plus mentions of children, kids, etc. vs. 3,000+ mentions of adults. So according to those numbers there are possibly 10 times as many jobs teaching children than there are adults. Do you like teaching children? That's a common question employers will ask. If you have experience teaching children or just like teaching children then put that on your resume. If these words apply to you and the position you are applying to then you can use them on your resume/cover letter and or in your interview. If they don't then try to find a job that may suit you better. There weren't many, but there were a few. TEFL certification is in greater demand in China than it is in other Eastern Asian countries. Most schools in Japan and Taiwan hire in country. Some schools in Japan require some Japanese ability which is extremely uncommon in other countries in Asia. Teaching demos are more common in Taiwan and China than other countries. Where should you teach English in Asia? Those are the common preferences, but keep in mind that there are often unsaid preferences too. Online TEFL training geared towards teaching kids in Asia.